Making Tough Love Work In Your Business. Sometimes in business, as well as in life, we are faced with making some tough decisions. Sometimes we have business relationships that just simply do not “cut the mustard”. These are relationships in our business that are either very one-sided, or are very unbalanced [and yes, there is a difference], or are scowled upon as simply being obtuse. A one-sided relationship in business would be one where one side was repeatedly and continuously giving, while the other side was repeatedly laying back, doing not much, and taking. An imbalanced relationship would be one where we see both sides providing some level of effort, but with one side providing considerably more effort than the other side. And an obtuse relationship would be one where from appearances, one side was completely “a fish out of water”. Firstly there will always come a point in every business relationship where we must re-evaluate the purpose of that relationship and whether there is a reason to continue that relationship. For example, in dentistry, your dental office may have a laboratory or a supplier that you have had a long term relationship with, but you have tolerated some shortfalls, which have gradually worn you down. When I was an assistant dentist way back when, my employer had had a long-lasting relationship with a denture laboratory, but during my time at the practice, the delivery service from the laboratory had become dramatically less reliable. Along with this, the dental technician from the laboratory had developed a very regular and consistent quality [set-up] issue with the dentures being made for our patients. Finally, after being let down time and time again by this old technician, my employer asked me to contact a local dental technician who I had met, who quickly was able to attend our dental office then and there. This new younger technician was able to service our dental office with good workmanship, along with a regular and consistent turnaround timeframe between our appointments. A similar thing can be said about employees. There are only so many times, I mean a finite number of times, that an employer will tolerate repeated short fallings where the employee makes no progress in attempting to improve. A good employer will always reward initiative and drive shown by his employees. When either of those attributes are missing or begin to wane, then it is definitely time for the employer and the employee to address the relationship and decide whether the working relationship has reached a figurative “line in the sand”, or whether there is improvement and effort that is lacking, that could be applied. Complacency and apathy are the killers of healthy relationships. In a working environment, neither side should take the other side for granted. All business relationships should be treated with a similar delicacy to that with which we treat our personal relationships. We do need to always be sensitive and aware of the wants and the needs of all parties in the business. Rarely are business relationships truly equal. There is, in most cases, an imbalance between the provision of the service provided and the receipt of that service. When this is the case, and there is an imbalance, the over-giver may simply be grateful for repeated praise and thanks for providing that service. Expressing gratitude regularly can take you a long way. Management that praises and compliments its employees, and its trades and suppliers, will always go further towards the maintenance of strong working relationships than those arms of management that fail to praise. And sometimes all that is required is regular and repeated acts of recognition and gratitude and praise. Take a good hard look at all the relationships within and outside of your business. Are they well balanced with a fair and reasonable win-win outcome available for each party? If they are not balanced, ask yourself if that relationship needs some attention so as to ensure the longevity of the association. You cannot build a long term successful business based on imbalances and misconceptions. There will always be cancellations. You can’t stop people from cancelling appointments, but what you can do is courteously help them. You can help them to keep their appointment by prioritising their commitment to their dental treatment required. There will always be reasons for rescheduling and cancelling. What we need to do is to be able to prioritise those reasons and then help the patient to make another appointment as quickly as possible, before their condition gets worse, or dare I say, irreparable. A cancellation will be either for a genuine reason or for a fake reason. Sometimes what the patient considers a genuine reason is actually a third category of reason, that I call a “ghost”. The reason looks real to them, but in actual fact, the reason is an illusion. A ghost reason can be logically resolved. The big problem with receiving calls to cancel and reschedule is that we as the dental office feel hurt and rejected, and therefore we can often react accordingly. And a reaction is wrong. We always need to be compassionate and concerned. No matter what the reason put up for the appointment cancellation. If we do not take the call with compassion, we have very little chance of the patient reprioritising and keeping the appointment, or of the patient reorganising their affairs so that they might still be able to be treated that day, if a same day solution [at another time] is available. Sometimes the reason promoted for the appointment change may not actually be the true reason for changing, but may be a reason being put forward. In this instance, expressing compassion and courtesy can often draw out some contrition from the caller that results in the them keeping the appointment. The best way to handle these cancellation calls is to ask the caller questions. I don’t think it is of any use to revert to our *CANCELLATION POLICY*. In fact, if you have an officer Cancellation Policy, I suggest you destroy it. After all, it really is an indication that your office has a bigger problem. Having a cancellation policy and dragging it out and using it, and sometimes displaying it, is like wearing a neon sign around your neck that says “I’m stupid”. The neon sign draws attention to the lack of intelligence. The cancellation policy draws attention to the fact that you have cancellations. The main reason that patients cancel appointments unnecessarily is because they don’t understand the importance and urgency about the treatment that they are having. We need to religiously invest time with our patients when they are in our office about the importance of their next appointment, and what will happen if the treatment is deferred or delayed. If we fail to do this routinely then we only set ourselves up to receive cancellations. But again, the education here must be done compassionately and without lecturing or demeaning. Never show frustration about the changed appointment. But to stay in control we need to appear to be unphased and cool. We need to embrace their reason, then clarify, and ask compassionate questions. There are some very valid reasons for changing appointments. Deaths, traumas, and medical emergencies are amongst those reasons that we do need to be accepting of. But it is important to make note of repeat reasons and excuses. The keeping of a daily call log book in your dental office where ALL incoming calls to the dental office are noted, does allow our office to monitor the number of cancellation calls and the reasons for the cancellations, as well as which team member is taking the calls and what their results are on each of those calls. Remember what gets recorded gets improved upon. If we know what our most common reasons are for appointment changes we can learn to improve upon the way we deal with those calls, as well as be able to address those reasons in advance at the time of making the appointments. Is a very important way to pre-empt any changes. The patient already knows that the treatment they will receive is important and urgent, and by asking this question, we can gain an added commitment from the patient to keep the appointment, because if they did have a desire to reschedule for a minor reason, they will remember that they had told us that they were not aware of any reason that would prevent them keeping the appointment. And therefore, will renege on calling to cancel. By asking this routinely we can certainly reduce the number of appointments changed for “ghost” reasons and fake reasons. Remember, it is our duty to do everything that we can to help our patients have the treatment they need and to not let them defer and delay this necessary treatment. This is how we serve our patients. Allowing patients to defer and delay treatment because of an inability to work with their concerns, is not in the patients’ best interests. Courteously handling these calls goes a very long way towards building the trust and the necessary relationships that in turn fosters the respect between patients and dental office that results in more appointments being kept. Have you ever noticed that all your best patients are the ones who accept their recommended treatment, happily make and keep their appointments, and are even happy to bring their appointments forward if the opportunity arises? One of the things that really separates a great business ahead of other businesses is the quality of its leadership. Traditionally, when you see a great business there is always a great captain of the ship. It’s very difficult for a poorly led business to achieve greatness. Take a look at great businesses that you know of…there is always a great leader at the front. And the opposite is true. When businesses unravel, it is usually poor leadership or weak leadership that stands out as being a feature of that business. In Australia great companies such as Westfield, News Corp have had great long-term leaders in Frank Lowy and Rupert Murdoch. In the US, Berkshire Hathaway and Buffet spring to mind. So what are the characteristics of great leaders? A great leader knows where he is going. He’s clear about that and he’s laser focused. His company looks to him to show them the way, to lead them towards nirvana, and he in turn knows how to deliver that vision that his team members seek. Commitment to do what it takes to get the job done. If the business is going to get to where it needs to go, then the team looks to the leader for assurance when times seem tough. A leader who is rock solid sets the example to the whole team. He sets the example by his actions, and those actions build respect. A great leader knows WHY his business does what it does [in a global sense]. His business has been created for a purpose. It fulfils a genuine need for the community. He may be a hard man, but he’s fair. His decisions may seem tough, but they are correct, and for the correct reasons. He doesn’t suffer fools. But he is willing to give people a fair go. He won’t step on someone to get ahead. He will succeed with dignity. If you want to be a great leader of a great business you need to lead by example. Follow these five characteristics to set yourself apart as one of THE great leaders. There you go…. I’ve mentioned the elephant in the room. The Most Reverend Michael Curry spoke for way too long and lost connection with members of his audience. With members of his live audience and also with members of his television audience. The fact that we had images of members of the Royal family, laughing, sniggering, dropping jaws and sideways glancing indicated to me that Bishop Curry had disconnected with his audience. Perhaps he had even failed to connect with members of his audience in the first place. How can we learn from this and apply it to dentistry? If we are to ensure that our message is indeed impactful we need to make sure that it is “to the point” and direct and is not smothered in excess conversation. Could Michael Curry have delivered the same message with more impact in five minutes instead of the fourteen that he did take? In dentistry we are often guilty of getting on to our own agenda instead of staying with the agenda of the patient. I’ve seen dentists waffle on and on with sermons full of technical terms and patients’ minds start wandering and disconnecting. The patients cannot see the relevance of some of the talk and they switch off. And although the dentist means well, his message is not acted upon. Even Michael Curry recognised a point in his sermon where he needed to get back to what we were all there for….and that was to see Harry and Meghan tie the knot, but yet he digressed again….. So next time you’re talking treatment with your patient, ask yourself whether you’re talking about their reasons for treatment, or whether, as one dental assistant once told me about her dentist, you’re teaching the patient a degree on dentistry? Your Business Needs To Have A Purpose. Your dental business needs to have a purpose. So many times I see dentists running businesses where the only purpose of the dental business is to stay in business for the next day only. With no longer term plan. And that’s not a very good plan. Going to work tomorrow because it’s what you did yesterday and what you did the day before that and also the day before that, is not a very intelligent way to live out an existence. The purpose of being in business is to generate an income that pays you so well that you could easily afford not to ever be in business ever again….. moving forward. Is your dental business creating freedom for you the owner? Or is your dental business running you? Is your dental business generating sufficient income to allow you to spend some now, on yourself, while you are able to enjoy it, as well as allow you to start squirrelling some of your income away so that you will be able to walk away some day and be comfortable with the things you have achieved and accomplished. If you are not able to do both those things with the income generated from your business, then you are always going to be a prisoner of your own situation. And what is the point of all that? You may as well just have a job. And work for someone else. Sometimes I see dental practices with multiple chairs and multiple associate dentists and multiple dental assistants. But the practice owner is the only dentist producing, and the associate dentists are there being baby sat, because they flat out are producing no revenue and no profit. Are you surrounding yourself with cardboard cut-out associates? Many years ago I employed a dentist for a year to mentor her. Every Friday, for one hour, we would review her week and look at her treatments and cases. 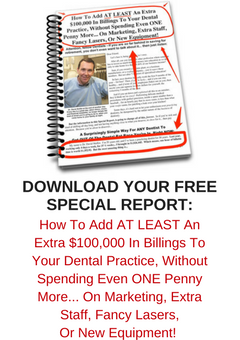 At the end of the year, I figured out that if I’d have spent that hour drilling teeth instead of mentoring this dentist, I’d have generated more income for the practice than the revenue the practice gained from her being employed. I literally was paying her to waste my time. You’ve studied too hard, and spent too much time and money becoming a dentist, and becoming the owner of a dental practice, to be wasting that investment and failing to treat your business as a business. Are you in business to create Freedom for yourself? Omer Reed told me that ninety five percent of US dentists reaching age sixty-five have to keep working and cannot retire because they aren’t able to pay themselves in retirement the same as what they earn as a dentist…. And *THAT* is really sad. Don’t be one of the ninety five percent….